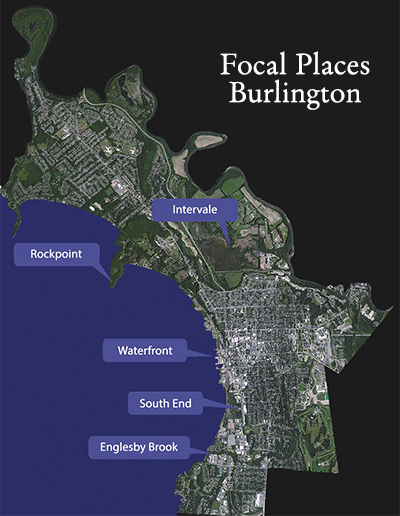 For a city the size of Burlington—only 10 square miles (less than half the size of the island of Manhattan)—Burlington contains within it varied landscapes ranging from wetlands, to dry oak forests, to riverine forests, all sitting atop different soils and unique geologies. For several years, graduate and undergraduate students from UVM service-learning courses and local high school groups have been involved in gathering data and developing interpretative materials related to these various areas of the Burlington landscape. These areas, listed on the left (illustrated on the right), are just some of the many “sub-geographies” of the Burlington landscape. The overall goal of university-based, service-learning courses is to engage with the City of Burlington as it seeks to implement a new sustainability planning initiative under the leadership of the Burlington Legacy Program and the ECOS Project of the Chittenden County Regional Planning Commission. Follow the ever-evolving links on the side to learn more about some of these particular places within the Queen City.